Opportunism sometimes can be a dangerous thing. 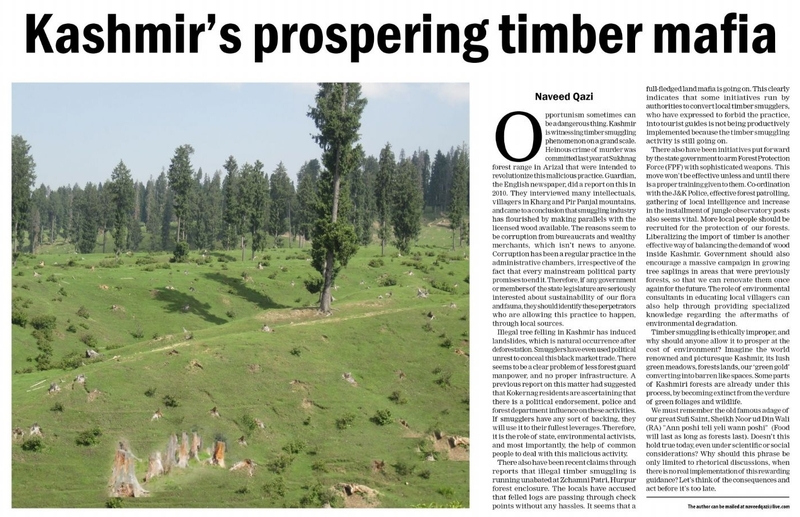 Kashmir is witnessing a timber smuggling phenomenon on a grand scale. Even murders happened last year at Sukhnag forest range in Arizal, that were intended to revolutionise this malicious practice. Guardian, the English newspaper, did a report on this phenomenon in 2010. They interviewed many intellectuals, villagers in Kharg and Pir Panjal mountains, and came to a conclusion that smuggling industry has flourished by making parallels with the licensed wood available. The reasons seem to be corruption from bureaucrats and wealthy merchants, which isn’t news to anyone. Corruption has been a regular practice in the administrative chambers, irrespective of the fact that every mainstream political party promises to end it. Therefore, if any government or members of the state legislature are seriously interested about sustainability of our flora and fauna, then they should identify these perpetrators who are allowing this practice to happen, through local sources and increased police surveillance. Illegal tree felling in Kashmir has induced landslides, which is natural occurrence after deforestration. Smugglers have even used political unrest to conceal this black market trade. There seems to be a clear problem of less forest guard manpower, and no proper infrastructure. A previous report on this matter had suggested that Kokernag residents are ascertaining that there is a political endorsement, police and forest department influence on these activities. If smugglers have any sort of backing, they will use it to their fullest leverages. Therefore, it is the role of state, environmental activists, and most importantly, the help of common people to deal with this malicious activity. There also have been recent claims through reports that illegal timber smuggling is running unabated at Zchamni Patri, Hurpur forest enclosure. The locals have accused that felled logs are passing through check points without any hassles. It seems that a full-fledged land mafia is going on, which is no less vile than any political disturbance. If forest department is accused of being in league with smugglers, then surely, these activities will intensify. This clearly indicates that some initiatives run by authorities to convert local timber smugglers, who have expressed to forbid the practice, into tourist guides is not being productively implemented because the timber smuggling activity is still going on. There also have been initiatives put forward by the state government to arm Forest Protection Force (FPF) with sophisticated weapons. This move won’t be effective unless and until there is a proper training given to them. Co-ordination with the J&K Police, effective forest patrolling, gathering of local intelligence and increase in the installment of jungle observatory posts also seems vital. More local people should be recruited for the protection of our forests. 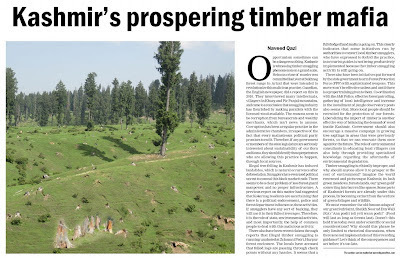 Liberalising the import of timber is another effective way of balancing the demand of wood inside Kashmir. Government should also encourage a massive campaign in growing tree saplings in areas that were previously forests, so that we can renovate them once again for the future. The role of environmental consultants in educating local villagers can also help through providing specialised knowledge regarding the aftermaths of environmental degradation. Timber smuggling is ethically improper, and why should Kashmiri people allow it to prosper at the cost of our environment? Imagine the world renowned and picturesque Kashmir, its lush green meadows, forest lands, our ‘green gold’ converting into barren like spaces. Some parts of Kashmiri forests are already under this process, by becoming extinct from the verdure of green foliages and wildlife. Let us go back to the old famous adage of our great Sufi Saint, Sheikh Noor ud Din Wali (ra) "Ann poshi teli yeli wann poshi" (Food will last as long as forests last). Doesn’t this hold true today, even under scientific or social considerations? Why should this phrase be only limited to rhetorical discussions, when there is no real implementation of this rewarding guidance? Let’s think of the consequences and act before it’s too late.